Hero imaged provided by Ridge to Reefs. During the New Year, the 100th day since Hurricane Maria (and 114th day since Hurricane Irma) raged through the Caribbean’s Greater Antilles - passed with little notice from mainland media or the general public. While running water and electricity have been reported as restored to the majority of households across Puerto Rico (inconsistencies in government reporting range from 60-70%)- there are unquestionably far too many households, and even entire communities, that remain without these basic necessities. Areas at highest risk are the more inland rural areas still isolated by impassible roads and bridges. It is these communities that Surfrider’s Rincón Chapter and their local partners at the RBC Maria Relief Center and the Costa Salud Health Center are focused on helping. The local Surfrider chapter has expanded their water-testing program to include freshwater bodies that communities, out of desperation, have been using to source drinking water. In addition to providing water quality information to the local Rincón community, the chapter has been traveling throughout inland Puerto Rico to spread awareness and help identify safe drinking water sources. Their results help notify the public of high-risk water bodies and protect communities from consuming harmful bacteria and associated pathogens and viruses. Get more information on the continued need for clean water in Puerto Rico and the partnership to empower local communities on the western-side of Puerto Rico to monitor water quality and protect their health in post-storm conditions. In December 2017, the Rincón BWTF continued to test fresh water sources near Maricao High School and provide community outreach to make sure teachers, students and their families have the information needed to protect their health in post-storm conditions. 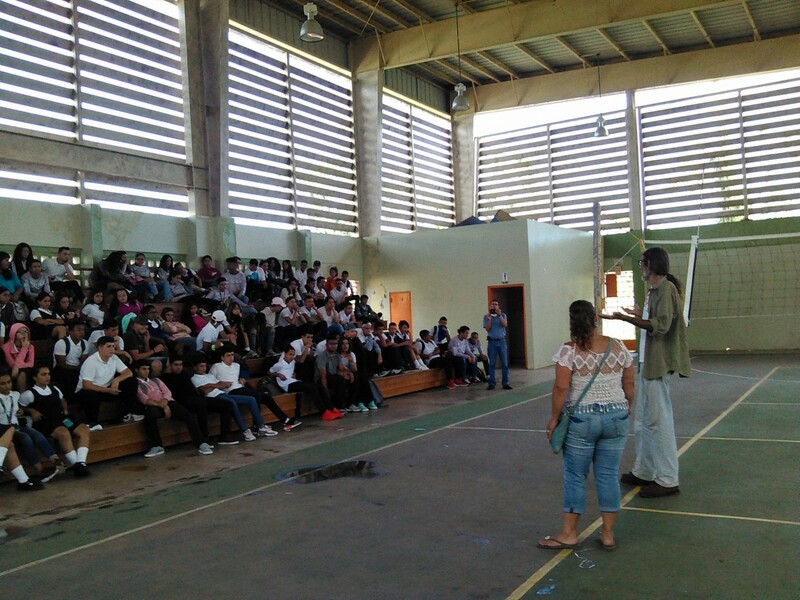 Steve Tamar, Rincón's BWTF coordinator, and Yvonne Schiffer, dedicated volunteer accompanying Steve and distributing water filters and solar lights when needed, talked to students about ways to avoid exposure to contaminated water. Tamar and Schiffer also trained students and teachers on how to properly use water filters to ensure safe consumption of drinking water in their homes. The school community has been so receptive and appreciative of these efforts that they have offered to continue to monitor freshwater springs and other surface water bodies in the area, under the training of Tamar. For the chapter, it has been so encouraging to see the students in a school that has received such little attention and assistance have so much stoke in this opportunity to make a positive difference in their families and community. 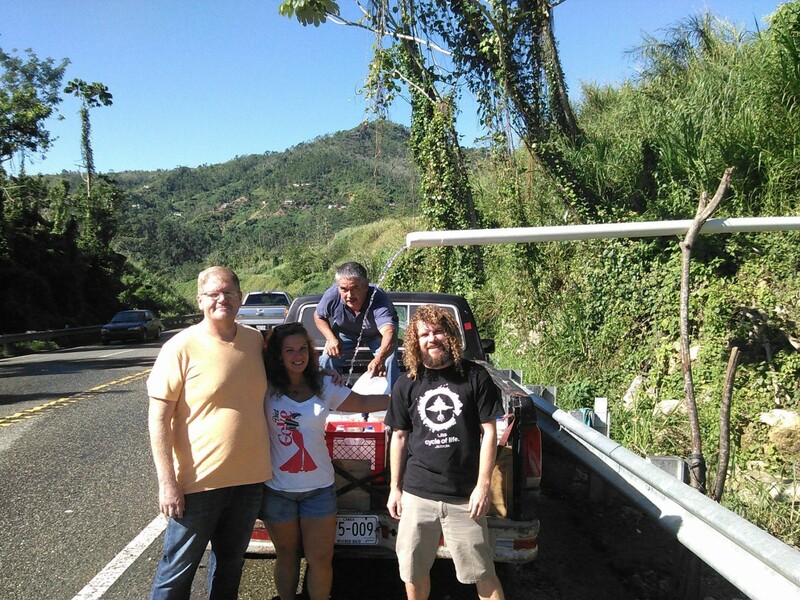 Tamar and Schiffer also visited the rural inland community of Utuado twice this past month. During their first visit they talked to the locals to identify freshwater springs and other sources that were being used as sources of drinking water. Water filters were distributed and initial tests of community sources of household water were performed. The first round of results showed high bacteria levels at three main water sources, which cumulatively were being used by hundreds of people. Initial results far exceeded safe drinking levels of coliform bacteria. Fortunately, these same sampling sites tested at much safer levels during the second round of testing. For updates on Surfrider Rincón's testing of community sources of water, please visit the chapter’s Facebook page. Relief team pose in front of someone filling up containers of water from one of the sources of water that fortunately tested clean in Utuado. Bacteria levels measured through Rincón's normal BWTF water testing program have predominantly been safe, although there are some localized pollution problems most likely caused by failing and damaged sewage infrastructure and stormwater runoff. In order to increase the accessability of their data and to get critical water quality information into the hands of beachgoers, the Rincón Chapter's BWTF data is now avaialble on the Swim Guide's mobile application. Swim Guide was created by Swim Drink Fish Canada (formerly Lake Ontario Waterkeeper) and has since grown into a global platform hosting water quality data from over 70 affiliate organizations across North America, the Caribbean, New Zealand and Australia. The Swim Guide smartphone apps and website allows users to browse by region to check the water quality of their favorite beaches. The iOS app is available in French and Spanish, and the website is bilingual. The beach water quality monitoring program run by the Junta de Calidad Ambiental agency also began sampling beaches again in December and their results can be viewed at Caricoos.org. Water sample being pulled at the beach. 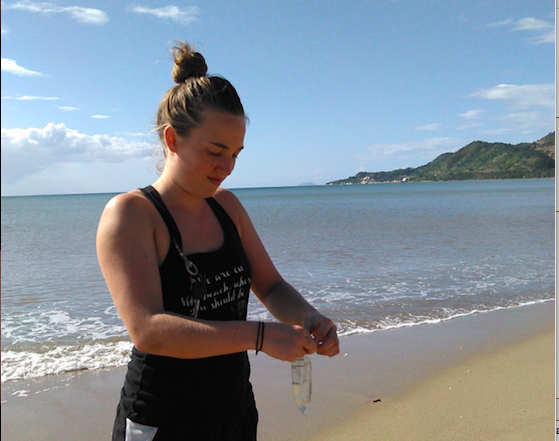 Surfrider’s staff scientist, Katie Day, returned to her home island over the holiday break, and helped volunteers with the local nonprofit Love City Strong test drinking water sources. Unlike Puerto Rico, most St John residents collect drinking water by capturing rainwater, and storing it in a man-made reservoir called a cistern. Unfortunately, high levels of storm water and debris flushed into many cisterns during the hurricanes, severely increasing the levels of bacteria. Roughly half of the 30 cisterns tested to date have had high- to intermediate bacteria levels, exceeding safe drinking levels. Even Day’s own family’s water cistern showed high levels of bacteria as seen in the below photo. For those in need, Day and Mia Dixon, a dedicated volunteer and school teacher, distributed water filtration systems donated by Waves for Water, and conducted training sessions to ensure that recipients knew how to properly use and maintain their filters (over 300 filters have been distributed since the storm). Read more about this effort to provide water quality information at St John beaches and sources of household water here and view their results here.